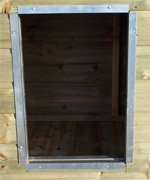 – This dog kennel has a Full roof and access doors to kennel and to the run, with pophole in the internal divide panel. – Galvanised bar panels used as standard for the front panel on our dog kennels (5cm Gap Bars as standard). – The framework on the Elms Dog Kennel is 44 x 44 mm timber and the kennel is Clad with ex 16mm redwood ship lap. – The roof on the Elms is now made using Heavy Duty Tongue and Groove Boards and is felted with a Heavy Duty Chester felt. – The timber used by Duchy Farm Kennels is pressure treated so no need to worry about the use of harmful chemicals or toxic fumes. Each Bay has a 5 x 4 Kennel & a 2 Meter Long Run. All Duchy Fam dog kennels are not only delivered free of charge, but also professionally fitted free of charge too. Leaving you secure in the fact your new kennel has been correctly erected a strong structure ready to withstand the elements. A much better option than having a pallet arrive loaded with pieces of timber and poor instructions.